Nobel Economist Joseph Stiglitz Hails New BRICS Bank Challenging U.S.-Dominated World Bank & IMF | Democracy Now! Nobel Prize-winning economist, professor at Columbia University and former chief economist at the World Bank. He is author of numerous books. In 2002, Stiglitz published a best-selling book called Globalization and Its Discontents, in which he critically examined international institutions such as the IMF, WTO and World Bank. Click here to watch Part 2 of this interview. JUAN GONZÁLEZ: A group of five countries have launched their own development bank to challenge the United States-dominated World Bank and International Monetary Fund. Leaders from the so-called BRICS countries—Brazil, Russia, India, China and South Africa—unveiled the New Development Bank at a summit in Brazil. The bank will be headquartered in Shanghai. Chinese President Xi Jinping said the agreement would have far-reaching benefits for BRICS members and other developing nations. PRESIDENT XI JINPING: [translated] Through the concerted effort from all sides, we have managed to reach a consensus in the creation of the BRICS development bank today. This is the result of the significant implications and far reach of BRICS cooperation and is therefore the political will of BRICS nations for common development. This will not only help increase the voice of BRICS nations in terms of international finance, but, more importantly, will bring benefits to all the people in the BRICS countries and for all peoples in developing countries. AMY GOODMAN: That was Chinese President Xi Jinping. Together, BRICS countries account for 25 percent of global GDP and 40 percent of the world’s population. For more, we’re joined now by Joseph Stiglitz, the Nobel Prize-winning economist, professor at Columbia University, author of numerous books. His new book is called Creating a Learning Society: A New Approach to Growth, Development, and Social Progress. JOSEPH STIGLITZ: Good to be here. AMY GOODMAN: Talk about the significance of this bank. JOSEPH STIGLITZ: Oh, it’s very, very important, in many ways. First, the need globally for more investment—in the developing countries, especially—is in the order of magnitude of trillions, couple trillion dollars a year. And the existing institutions just don’t have enough resources. They have enough for 2, 3, 4 percent. So, this is adding to the flow of money that will go to finance infrastructure, adaptation to climate change—all the needs that are so evident in the poorest countries. Secondly, it reflects a fundamental change in global economic and political power, that one of the ideas behind this is that the BRICS countries today are richer than the advanced countries were when the World Bank and the IMF were founded. We’re in a different world. At the same time, the world hasn’t kept up. The old institutions have not kept up. You know, the G-20 talked about and agreed on a change in the governance of the IMF and the World Bank, which were set back in 1944—there have been some revisions—but the U.S. Congress refuses to follow along with the agreement. The administration failed to go along with what was widely understood as the basic notion that, you know, in the 21st century the heads of these institutions should be chosen on the basis of merit, not just because you’re an American. And yet, the U.S. effectively reneged on that agreement. So, this new institution reflects the disparity and the democratic deficiency in the global governance and is trying to restart, to rethink that. Finally, there have been a lot of changes in the global economy. And a new institution reflects the broader set of mandates, the new concerns, the new sets of instruments that can be used, the new financial instruments, and the broader governance. Realizing the deficiencies in the old system of governance, hopefully, this new institution will spur the existing institutions to reform. And, you know, it’s not just competition. It’s really trying to get more resources to the developing countries in ways that are consistent with their interests and needs. JUAN GONZÁLEZ: And the importance of countries like China, which obviously has huge monetary reserves, and Brazil, which had developed its own development bank now for several years, their being key players in this new financial organization? JOSEPH STIGLITZ: Very much. And that illustrates, as you say, a couple interesting points. China has reserves in excess of $3 trillion. So, one of the things is that it needs to use those reserves better than just putting them into U.S. Treasury bills. You know, my colleagues in China say that’s like putting meat in a refrigerator and then pulling out the plug, because the real value of the money put in U.S. Treasury bills is declining. So they say, “We need better uses for those funds,” certainly better uses than using those funds to build, say, shoddy homes in the middle of the Nevada desert. You know, there are real social needs, and those funds haven’t been used for those purposes. At the same time, Brazil has—the BNDES is a huge development bank, bigger than the World Bank. People don’t realize this, but Brazil has actually shown how a single country can create a very effective development bank. So, there’s a learning going on. And this notion of how you create an effective development bank, that actually promotes real development without all the conditionality and all the trappings around the old institutions, is going to be an important part of the contribution that Brazil is going to make. JUAN GONZÁLEZ: And how has that bank functioned differently, let’s say, than other development banks in the North? JOSEPH STIGLITZ: Well, we don’t know yet, because it’s just getting started. The agreement—it’s been several years underway. The discussions began about three years ago, and then they made a commitment, and then they—you know, they’ve been working on it very steadily. What was big about this agreement was—there was a little worry that there would be conflicts of the interests. You know, everybody wanted the headquarters, the president. Would there be enough political cohesion, solidarity, to make a deal? Answer was, there was. So, what it is really saying is that in spite of all of the differences, the emerging markets can work together, in a way more effectively than some of the advanced countries can work together. 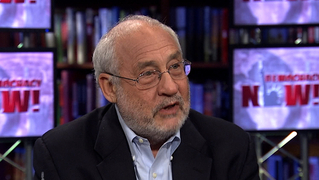 AMY GOODMAN: Joe Stiglitz, you’re the former chief economist of the World bank. What’s your assessment of the World Bank under the tenure of Jim Yong Kim, who is the former Dartmouth president? We just passed the second anniversary of his tenure there. JOSEPH STIGLITZ: Well, it’s still too soon to say. AMY GOODMAN: When it comes to issues of debt and other issues. JOSEPH STIGLITZ: You know, because it takes a while for somebody to get in charge of the bank and to—you know, it’s like a big ship, and you’re trying to shift it. I think there’s a broad concern that he brings certain very positive strengths to the bank—a focus on health and other social issues—but successful development will have to continue to have a focus on some of the old issues. So, you know, you have to grow. And he has a little bit less experience in the fundamentals of economic growth. I think he has probably more sensitivity to some of the problems that have plagued these international financial institutions in the past, the high conditionality. But he faces a governance problem. And that’s what this issue is about, a governance problem, where the head of the World Bank is chosen by the U.S., even though the U.S. is not playing the economic role and the leadership role that it did at one time. And we all believe in democracy, but a democracy says it shouldn’t be just assigned to one country. One of the interesting aspects of the discussions that I’ve heard is, you know, during the East Asia crisis, one of the senior, very senior U.S. Treasury officials said, “What are you complaining about, about our telling countries what to do? He who pays the piper calls the tune.” And what I hear now is the developing countries, emerging markets, China and the other countries, saying, “We’re paying the tune. We’re the big players now. We have the resources. We’re where the reserves are. And yet, you don’t want to let us play even a fair share in the role, reflecting the size of our contributions in the economy, in trade.” And so, that’s one of the real grievances—I think valid grievances. And it’s hard for an institution where the governance is so out of tune with current economic and political realities to be as effective as it could be. JUAN GONZÁLEZ: I wanted to ask you about a subject we just had on—were discussing in an earlier segment: immigration and this whole issue of the world economy and financial systems. You have the contradiction that, on the one hand, globalization is breaking down barriers to capital everywhere, and yet, in the advanced countries especially, you have the growth of anti-immigrant movements, not just in the United States, but in Europe, in England and in Holland. And so you have a situation where there’s an effort to erect barriers to labor and to the free flow of labor. And the impact of these kinds of debates—just a few days ago, you had Warren Buffett, Bill Gates and Sheldon Adelson, a conservative Republican, all blasting Congress for not being able to achieve some kind of comprehensive immigration reform. The impact of this on the world economy? AMY GOODMAN: We have 15 seconds. JOSEPH STIGLITZ: —but wages are down by 7 percent. AMY GOODMAN: We’re going to have to continue this conversation off air, and then we will post it at democracynow.org. I also want to ask you about the Trans-Pacific Partnership—you talk about it being on the wrong side of globalization—your assessment of President Obama when it comes to the growing gap in inequality in this country. Joe Stiglitz is the Nobel Prize-winning economist, professor at Columbia University, former chief economist of the World Bank. He is author of many books; his latest, Creating a Learning Society: A New Approach to Growth, Development, and Social Progress. That does it for our show. I’ll be speaking at the Mark Twain House in Hartford, Connecticut, Monday, July 21st, at 7:00 p.m.; in Martha’s Vineyard, Saturday, July 26, 7:00 p.m. at Katharine Cornell Auditorium in Vineyard Haven. Check out democracynow.org.